Prokhorov Nets sale: Billion-dollar valuations for heavily subsidized arena. 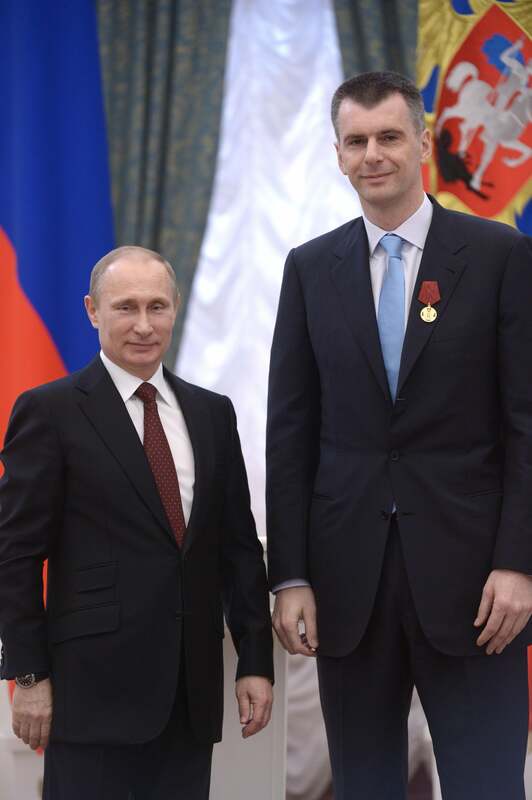 Vladimir Putin and Prokhorov in March. Prokhorov’s stewardship of the team itself has been a failure; the franchise loses money, hasn’t won 50 games in a season (a basic benchmark of a quality performance in the NBA) since he took over, and doesn’t seem likely to get better any time soon because it’s committed to long, expensive contracts with players who are getting worse every year. In the discussions, the team is being valued at $1.7 billion and the arena at $1.1 billion, said both sources. So Prokhorov has made himself another billion-plus dollars by, more or less, getting United States and New York taxpayers to subsidize four years of acting as counterfactual proof that the Nets could be a big deal if they weren’t run poorly. That, as they say, is nice work if you can get it. But if you don’t already have millions of dollars and social relationships with powerful public officials, you can’t get it. Correction, Oct. 15, 2014: This post originally misstated that land was acquired for the Barclays Center using only the threat of eminent domain seizure; some area properties were acquired by the state via seizure, a process that is ongoing.